The birth of Christ. 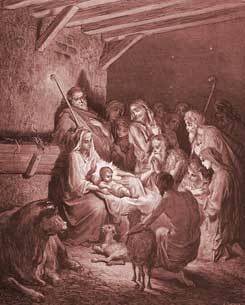 (1-7) It is made known to the shepherds. (8-20) Christ presented in the temple. (21-24) Simeon prophesies concerning Jesus. (25-35) Anna prophesies concerning him. (36-40) Christ with the learned men in the temple. (41-52)1-7 The fulness of time was now come, when God would send forth his Son, made of a woman, and made under the law. The circumstances of his birth were very mean. Christ was born at an inn; he came into the world to sojourn here for awhile, as at an inn, and to teach us to do likewise. We are become by sin like an outcast infant, helpless and forlorn; and such a one was Christ. He well knew how unwilling we are to be meanly lodged, clothed, or fed; how we desire to have our children decorated and indulged; how apt the poor are to envy the rich, and how prone the rich to disdain the poor. But when we by faith view the Son of God being made man and lying in a manger, our vanity, ambition, and envy are checked. We cannot, with this object rightly before us, seek great things for ourselves or our children. 8-20 Angels were heralds of the new-born Saviour, but they were only sent to some poor, humble, pious, industrious shepherds, who were in the business of their calling, keeping watch over their flock. We are not out of the way of Divine visits, when we are employed in an honest calling, and abide with God in it. Let God have the honour of this work; Glory to God in the highest. God's good-will to men, manifested in sending the Messiah, redounds to his praise. Other works of God are for his glory, but the redemption of the world is for his glory in the highest. God's goodwill in sending the Messiah, brought peace into this lower world. Peace is here put for all that good which flows to us from Christ's taking our nature upon him. This is a faithful saying, attested by an innumerable company of angels, and well worthy of all acceptation, That the good-will of God toward men, is glory to God in the highest, and peace on the earth. The shepherds lost no time, but came with haste to the place. They were satisfied, and made known abroad concerning this child, that he was the Saviour, even Christ the Lord. Mary carefully observed and thought upon all these things, which were so suited to enliven her holy affections. We should be more delivered from errors in judgment and practice, did we more fully ponder these things in our hearts. It is still proclaimed in our ears that to us is born a Saviour, Christ the Lord. These should be glad tidings to all. 21-24 Our Lord Jesus was not born in sin, and did not need that mortification of a corrupt nature, or that renewal unto holiness, which were signified by circumcision. This ordinance was, in his case, a pledge of his future perfect obedience to the whole law, in the midst of sufferings and temptations, even unto death for us. At the end of forty days, Mary went up to the temple to offer the appointed sacrifices for her purification. Joseph also presented the holy child Jesus, because, as a first-born son, he was to be presented to the Lord, and redeemed according to the law. Let us present our children to the Lord who gave them to us, beseeching him to redeem them from sin and death, and make them holy to himself. 25-35 The same Spirit that provided for the support of Simeon's hope, provided for his joy. Those who would see Christ must go to his temple. Here is a confession of his faith, that this Child in his arms was the Saviour, the salvation itself, the salvation of God's appointing. He bids farewell to this world. How poor does this world look to one that has Christ in his arms, and salvation in his view! See here, how comfortable is the death of a good man; he departs in peace with God, peace with his own conscience, in peace with death. Those that have welcomed Christ, may welcome death. Joseph and Mary marvelled at the things which were spoken of this Child. Simeon shows them likewise, what reason they had to rejoice with trembling. And Jesus, his doctrine, and people, are still spoken against; his truth and holiness are still denied and blasphemed; his preached word is still the touchstone of men's characters. The secret good affections in the minds of some, will be revealed by their embracing Christ; the secret corruptions of others will be revealed by their enmity to Christ. Men will be judged by the thoughts of their hearts concerning Christ. He shall be a suffering Jesus; his mother shall suffer with him, because of the nearness of her relation and affection. 36-40 There was much evil then in the church, yet God left not himself without witness. Anna always dwelt in, or at least attended at, the temple. She was always in a praying spirit; gave herself to prayer, and in all things she served God. Those to whom Christ is made known, have great reason to thank the Lord. She taught others concerning him. Let the example of the venerable saints, Simeon and Anna, give courage to those whose hoary heads are, like theirs, a crown of glory, being found in the way of righteousness. The lips soon to be silent in the grave, should be showing forth the praises of the Redeemer. In all things it became Christ to be made like unto his brethren, therefore he passed through infancy and childhood as other children, yet without sin, and with manifest proofs of the Divine nature in him. By the Spirit of God all his faculties performed their offices in a manner not seen in any one else. Other children have foolishness bound in their hearts, which appears in what they say or do, but he was filled with wisdom, by the influence of the Holy Ghost; every thing he said and did, was wisely said and wisely done, above his years. Other children show the corruption of their nature; nothing but the grace of God was upon him. 41-52 It is for the honour of Christ that children should attend on public worship. His parents did not return till they had stayed all the seven days of the feast. It is well to stay to the end of an ordinance, as becomes those who say, It is good to be here. Those that have lost their comforts in Christ, and the evidences of their having a part in him, must bethink themselves where, and when, and how they lost them, and must turn back again. Those that would recover their lost acquaintance with Christ, must go to the place in which he has put his name; there they may hope to meet him. They found him in some part of the temple, where the doctors of the law kept their schools; he was sitting there, hearkening to their instructions, proposing questions, and answering inquiries, with such wisdom, that those who heard were delighted with him. Young persons should seek the knowledge of Divine truth, attend the ministry of the gospel, and ask such questions of their elders and teachers as may tend to increase their knowledge. Those who seek Christ in sorrow, shall find him with the greater joy. Know ye not that I ought to be in my Father's house; at my Father's work; I must be about my Father's business. Herein is an example; for it becomes the children of God, in conformity to Christ, to attend their heavenly Father's business, and make all other concerns give way to it. Though he was the Son of God, yet he was subject to his earthly parents; how then will the foolish and weak sons of men answer it, who are disobedient to their parents? However we may neglect men's sayings, because they are obscure, yet we must not think so of God's sayings. That which at first is dark, may afterwards become plain and easy. The greatest and wisest, those most eminent, may learn of this admirable and Divine Child, that it is the truest greatness of soul to know our own place and office; to deny ourselves amusements and pleasures not consistent with our state and calling. Verse 38~The Jews in the first century were looking for the Messiah to come and provide deliverance. There are hidden gems of good examples in the Bible. Anna is a great example. Though briefly mentioned her faith was not forgotten by our Heavenly Father and she was mentioned in the gospel accounts. Though a widow and older in years, she maintained a good spiritual routine and remained active in God Service. We should imitate her example to remain faithful to God all our lives. Verse 51~Even though Mary may not have fully understood all that was being said or taking place, she kept those things in her heart. Mary cherished Jesus' words and actions. Glory to God for sending His own Son (God incarnate) to be born of a virgin and to die for us on the cross so that we could be saved from our sins. What a Saviour! I have not observed Christmas for over thirty years because I believe that mixing pagan tradition with His holy birth dishonors my Saviour. If God wanted us to observe Jesus' birth would He not have revealed this to us in His Word? What Do You Think of Luke 2? How old was Jesus when his parents left him behind at the temple in Jerusalem?